I first heard about them from competition fly fishermen. As I’ve written before, I think there’s much to be learned from people who compete and try to catch the most fish and the biggest fish (video here). 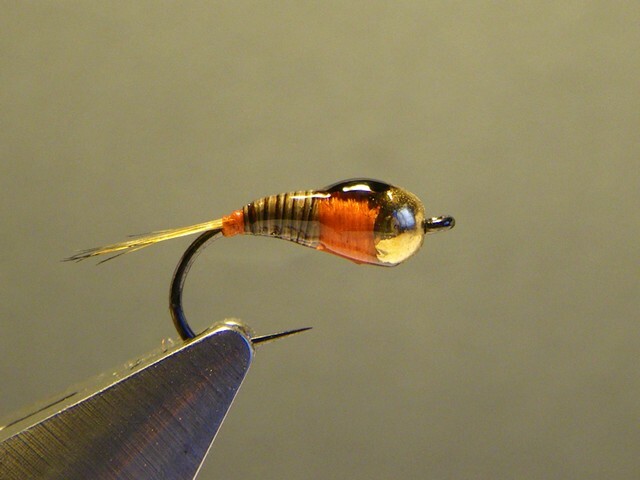 A Perdigón fly hails from anglers in Europe, and it often is used by tightline (or Euro-nymphing) anglers. They’re designed to sink quickly into the strike zone. And, they’re very durable. So, I’ve been making some, and I’m finding that they’re super-easy to tie. A tail, a thread body, wire for segmentation (or, not), and a thread hot spot collar. Then, you put on some epoxy to fill out and harden the fly. It also gives a nice glow to everything. I use Loon UV Finish, the thick kind. I put on the goop, smoothen it with a bodkin, and hit it all with a UV flashlight. Last, add a dot from a Sharpie pen to denote a wing case. Easy. I’ll let you know how it goes when I fish them this autumn. They do work very well at least in the spring. Does the Loon UV dry sticky or with a hard finish? Hard finish. It becomes like glass. Pretty cool. Last few times on the swift fishing these euro style has worked nicely for me – small ones – 16, 18, 20, 22. Orange, and black/pearl. Interesting! I've not nymphed at the Swift in a while but have found in the past that really plain ones work better for me. And, to your point, sizes 20 and smaller. What I find interesting is that the black spot (wing case) would end up on the bottom of the fly when using jig style hooks. Maybe it just serves as a big color contrast?? True. I think color contrast is a huge strike trigger, as bugs tend to have darker thoraxes and lighter bellies. Also, I read in an article that the wing case ridding on the bottom of of a jig-style hook shouldn't matter much. The flies in swift current are getting tossed around anyways, the author asserted. Also, I just noticed that the flies in the above photo are tied on regular hooks, not the jig-style ones. So, the wing case would be riding on top. When I tie these flies on the competition-style jig hooks, I just put the Sharpie dot on the the side where the hook point is; so, theoretically, those wing cases would be riding up top, too.